Nokia have announced that they are committed to making a 'more human' orientated brand. The Finns plan to tailor their tech to customers needs, it seems obvious, but you'd be surprised how many companies miss that! Obviously this sounds a bit like Samsung's 'designed for humans' and 'life companion' campaigns and we suppose it is, which isn't necessarily a bad thing! Fingers crossed this can help Nokia onto the right track! EA and Disney have struck a deal which will see all forthcoming Star Wars games developed and sold by EA for consoles, whereas Disney will make games for mobile and social networks. Hopefully EA will do a better job than they managed with SimCity! Rovio is finally starting to build out cross platform progress syncing for Angry Birds (an The Croods) so you can pick up where you left off on all your devices! It's about time guys! The update is live on the iOS version of the original Angry Birds game! There have been rumours of a Samsung phone which features a camera with excellent camera credentials today. If the rumours are right then the phone will have a 16MP camera, but otherwise it will feature mid-range specs such as a dual-core processor. Obviously this is a rumour, but Samsung has yet to carpet bomb the phones with great imaging capabilities arena, so we think this is a space to watch! Acer's has a good Q1 with profit up 55% compared to this time last year! Head over to PCAdvisor for the full run down! Some of you might recognise the name Jon Rubinstein? Well he was an old exec at Palm, who was carried across to HP too. Well he's now got a spot on Qualcomm's board to go with his position on Amazon's board and his past experience working at Apple on the iPod. The KeepRunner app for Android and iOS has been updated to add support for the Pebble smartwatch, so you can track the vital details about the speed, time and distance of your run! The company says they're committed to support this sort of wearable solution, which is great news for the future! FourSquare have released their app for Windows Phone 8 and it'll be preloaded on certain Lumia phones! The guys have promised an update for the Windows Phone 7 app is in the works too! Windows Phone is getting a lot of app love lately and the YouTube app! Microsoft have rolled out an update which actually makes this an app instead of a web link! You can now watch videos, access channels and playlists within the app and the update also lets you pin things to the start screen! Good stuff Microsoft! 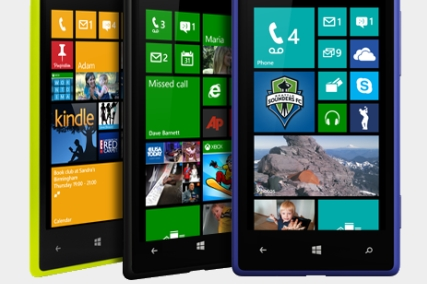 (Microsoft make the app for Windows Phone just like they do for the Facebook app). The UK has proposed changes to get 4G rolling out faster, check them out here on V3! Any creative students out there might be interested in Adobe's Creative Cloud at a reasonable price? Full details in the tweet below! The Android 4.1.2 Jelly Bean update for the Samsung Galaxy Note is rolling out OTA for UK owners! If you're phone is unlocked hit that software update button now! And finally, for those of you in the United States your new 'Un-carrier' T-Mobile have released a new ad aimed at dragging you iPhone owners away from other networks with the promise that you can use your phone the way you're meant to on their network! Check out the video below for full details! T-Mobile have also misplaced all their Windows Phones on their website. We're not sure why they're gone, but they are, possibly they're getting ready for the big announcement next week?